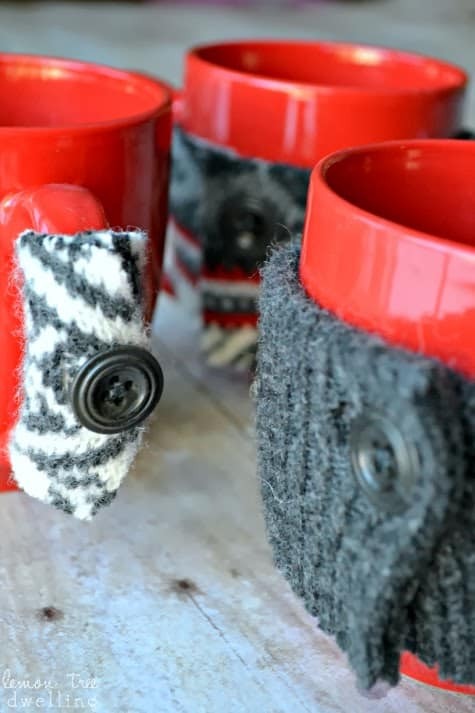 These Easy Mug Cozies are made from an old sweater! 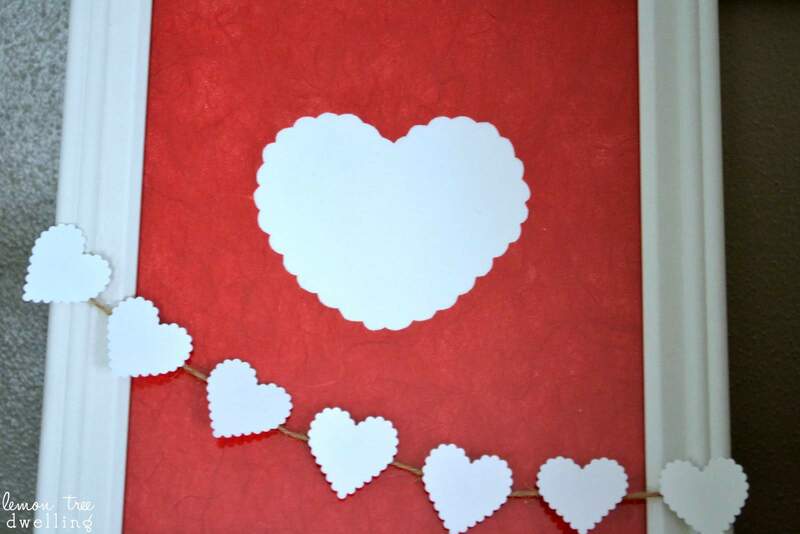 This upcycled craft is a great gift to give away to friends and family. 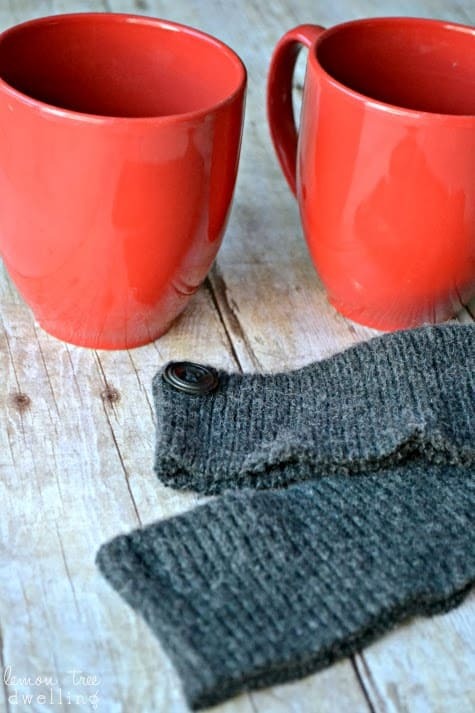 A cool, stylish way to drink your warm winter beverage. Is it just me….or do you kind of forget about all beverages other than coffee, tea, and hot chocolate in the winter time?? I usually go for coffee in the morning, tea in the afternoon and evening, and hot chocolate on special occasions. I must say, though, being pregnant really throws a wrench in my warm beverage obsession! Yes, I look forward to the days when I can drink freely without worrying or feeling guilty….and those days will come soon enough. (Just in time for warmer weather, right?) 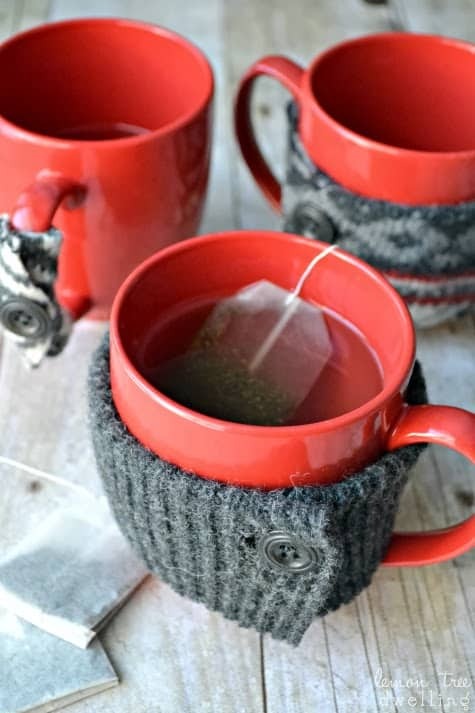 But until then, I’ve come up with a new way to enjoy my warm beverages: these adorable mug cozies! There is something about wrapping your hand around something cozy that feels just a little more enjoyable, a little more satisfying. Hopefully satisfying enough that I can get through the next weeks and months on just one cup a day! Since I don’t sew…..(at least not yet)…..I knew I needed to come up with a simple way to make these. And truthfully, these could not be simpler! 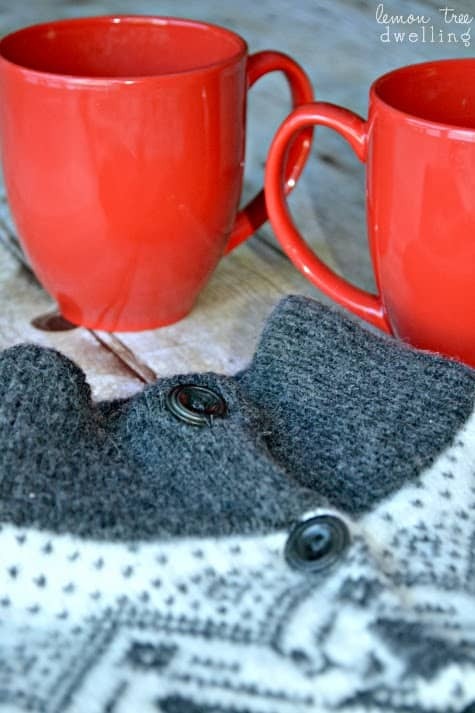 All you need is an old sweater with buttons, a good pair of scissors, and a couple of your favorite mugs! Then, just find a button and start cutting! You want to cut a strip long enough to wrap around your mug, but snug enough that it’s not going to slide around. And don’t worry about the button hole – just use your scissors to cut a new one wherever you need it! And then…..for a little fun…..try getting creative! 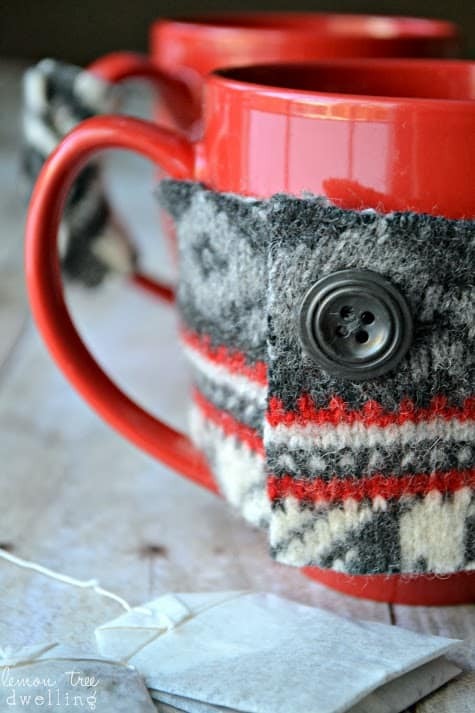 I love this handle cozy just as much or even more as the full mug cozy! It was a great way to use a smaller piece of fabric, and there’s nothing worse than a too-hot handle, which is especially a problem if you heat your water in the microwave. 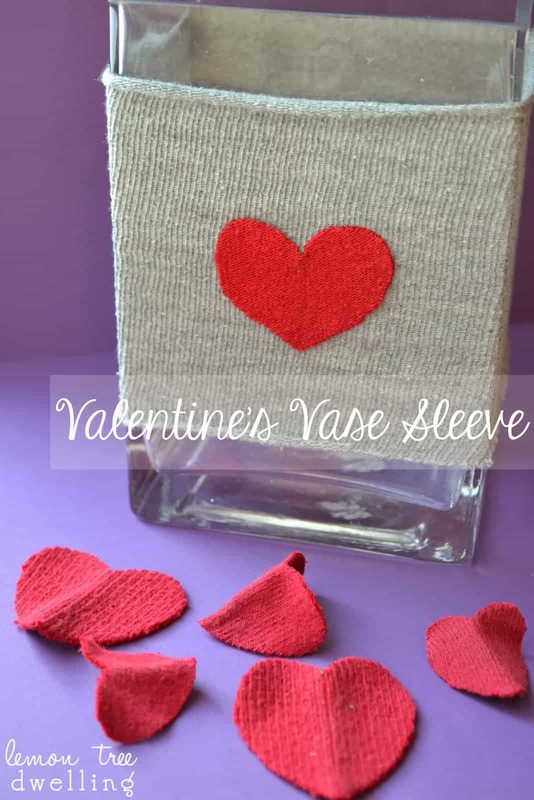 These are such a fun way to enjoy your winter beverage….and they’d make a perfect Valentine’s Day or winter birthday gift, as well! They can be personalized to any holiday, color scheme, or personality….and, paired with some coffee, tea, or hot chocolate, they are a gift that anyone would love! 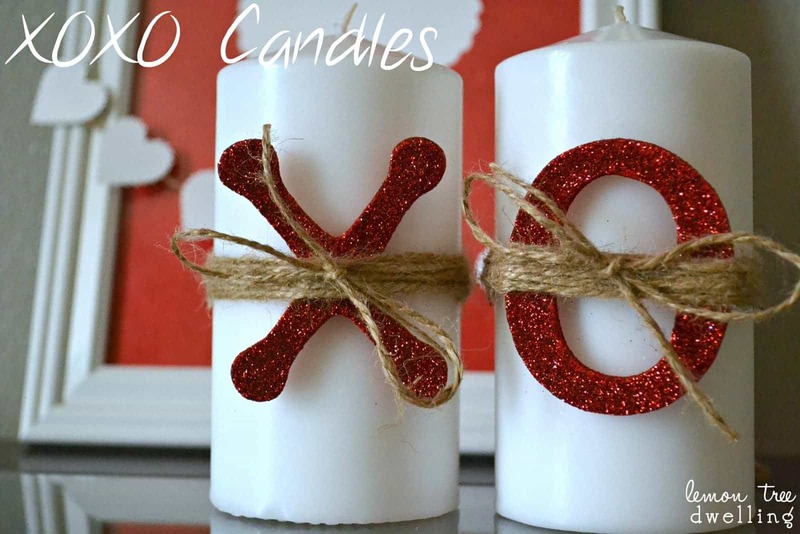 Looking for more simple Valentine’s Day gift ideas? Love these ideas! Very creative! Hi Cathy! I do a craft fair in Kennebunkport, Maine every year and needed and “extra” seller this year….I made a variation of these and they sold like hotcakes! Who knew they were so easy – everyone should be doing them! I love the ones you made! These are adorable, Cathy, and would really make a great gift! These are DARLING!!! I love them! What a fabulous idea, Cathy! this is a cute idea cathy! Not only are you fab in the kitchen, but you have such a creative crafting thing going on too! I love this! 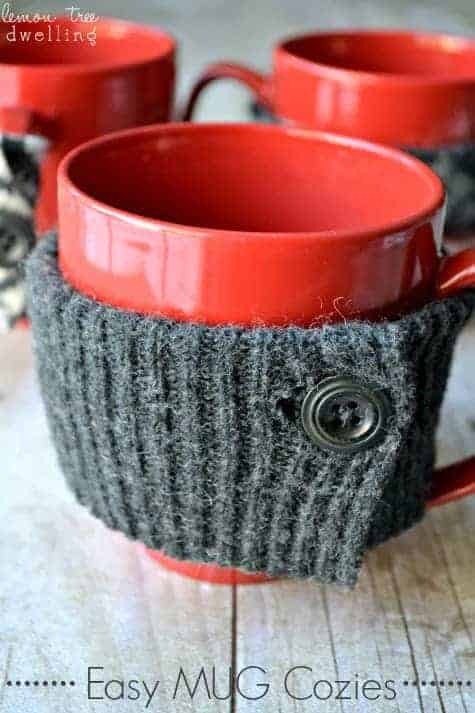 Great idea for mug cozies! These are too cute, I love them so much! I think my husband is getting rid of some sweaters, so I’ll see if any are workable. Pinning, and thanks for sharing this at Creativity Unleashed! Way to cute!! 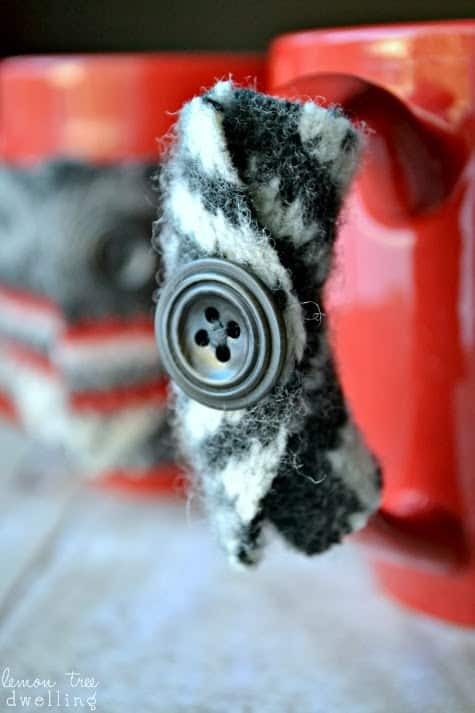 Such a great way to use old sweaters! Thanks for sharing at The Weekend Retreat, hope to see you back on Thursday! How do you keep the cut end from unraveling?